The legendary Kings of lounge have resurfaced! While many artists were riding the popular psychedelic wave during the summer of love, The Mighty Turbans held true to their unique vision with the acclaimed release of "Weenies with Martinis", widely considered to be the "Sgt. Peppers of lounge." 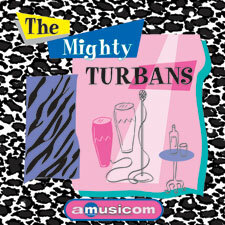 What better timing for the triumphant return of The Mighty Turbans? Strawberry martini anyone? 9 01:57 Shades & Waves Exotic Bossa Nova with vibes and piano, sets the "mood"
23 01:03 FULL60 Exotic Bossa Nova with vibes and piano, sets the "mood"
37 00:33 FULL30 Exotic Bossa Nova with vibes and piano, sets the "mood"
51 00:23 FULL20 Exotic Bossa Nova with vibes and piano, sets the "mood"
65 00:18 FULL15 Exotic Bossa Nova with vibes and piano, sets the "mood"
79 00:13 FULL10 Exotic Bossa Nova with vibes and piano, sets the "mood"
93 00:07 ALT Exotic Bossa Nova with vibes and piano, sets the "mood"